3068 36" x 80" 40" x 82"
3468 40" x 80" 44" x 82"
4068 48" x 80" 52" x 82"
3070 36" x 84" 40" x 86"
3470 40" x 84" 44" x 86"
4070 48" x 84" 52" x 86"
No problem. We can fabricate all of our hollow steel doors to fit any dimensions you have. Call or contact us today to speak with our fabrication specialists. No problem. We can demo out existing walls of any material to make room for your new door. Call or contact us today to speak with our demolition specialists. Don’t know what hardware you will need? Visit our hardware page for a full list of hardware & descriptions that we can install on your door or frame. One of the most crucial terms in the industry, yet the most commonly misunderstood is door handing. As seen in the diagrams the type of door handing you require is determined by which hand you would naturally grip the handle with, as well as which direction you would then move that hand in. 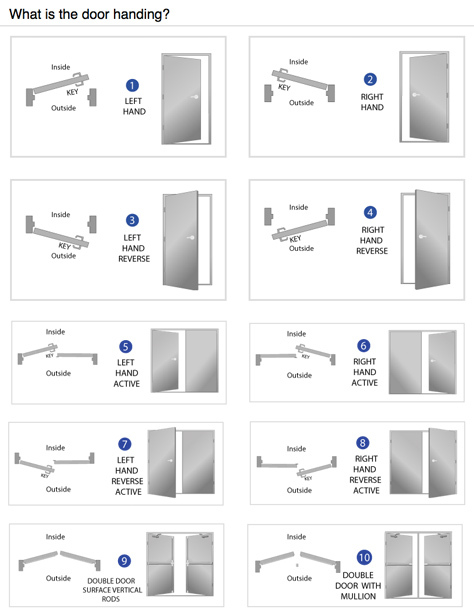 The ten types of door handing are self explanatory once the concept is understood: Left Hand, Right Hand, Left Hand Reverse, Right Hand Reverse, Left Hand Active, Right Hand Active, Left Hand Reverse Active, Right Hand Reverse Active, Double Door Surface Vertical Rods, and Double Door with Mullion. We hope these diagrams help clarify your needs, however please do not hesitate to call us should you need further assistance.